It appears the new sticker vendor that the State hired “inadvertently” sent out NON-Resident trail passes instead of Resident trail passes. This first came to light the afternoon of Sept. 19. Initially, it was thought only a few people were affected, however that was not the case! 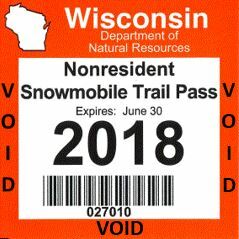 If you have received the wrong trail pass – please call the WI DNR – 888.936.7463. They are still in the planning stages of how they are going to rectify this situation, but they will take your information and be sure you get the correct trail passes. Members will have to return the NON-Resident passes so please hang onto them to send back.